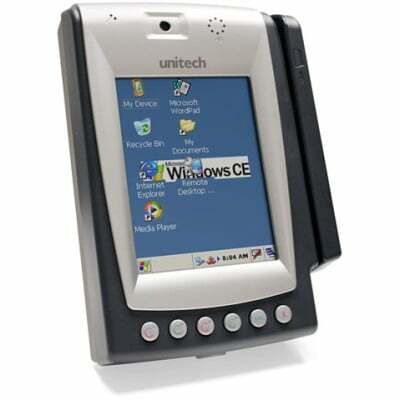 Unitech MR650 Terminal - Big Sales, Big Inventory and Same Day Shipping! The Unitech MR650 allows you to choose security features best suited for your business needs: contact-free proximity reader, fingerprint reader, barcode reader or magnetic strip reader. Four TTL digital inputs and three relay output controls provide the versatility to manage access control. Extra security can be added with a built-in 1.3 mega pixel CMOS camera with microphone and speaker to provide audio intercom for continuous surveillance. All data is clearly captured on the 240 by 320 pixel color touch screen. In order to safeguard your security and your data, the MR650 comes standard with UPS battery, providing 2 hours of operation without main power or up to 3 days of data backup. MR650, Intel PXA270 @ 520 MHz, 128MB RAM, 64MB FlashROM, 5.6"TFT - LCD QVGA, Ethernet interfaces, BC Slot Reader, 125KHz, Color Camera.